As there is no important economic reports in the US and Canada, USDCAD will be less active today. 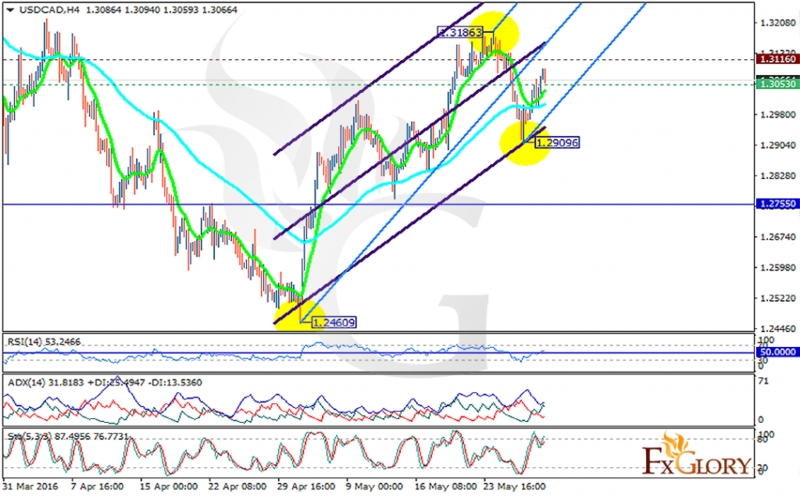 Since the previous low at 1.29096, USDCAD has been moving with bullish bias along with several pullbacks on the way. The support rests at 1.30530 with resistance at 1.31160 which both lines are above the monthly pivot point at 1.27550. The EMA of 10 is above the EMA of 75 pointing to the recent price growth. The RSI is in neutral zone, the Stochastic is showing upward momentum and the ADX is showing stronger buyers than sellers. The pair may continue its upward movement within Andrews’ pitchfork. Long positions are recommended with the target at 1.2997.